On December 12, 2018, a dissemination event was held within the framework of the Poseidon Med II (PMII) programme to the Port Authority of Igoumenitsa (OLG SA), which was addressed to the authorities of the Igoumenitsa Port Authority, as well as to representatives from the Chamber of Thesprotia. 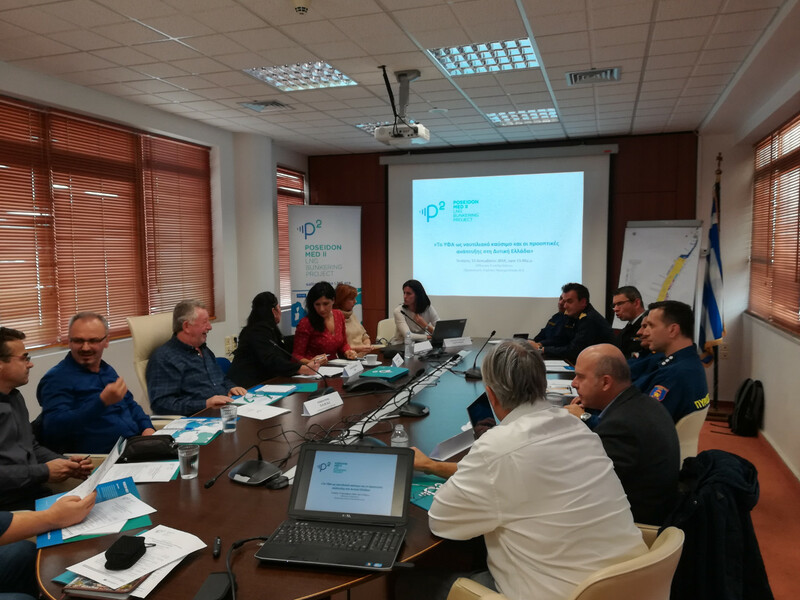 The discussions focused on the progress of the work of the PMII's individual actions and on the results to date with a focus on the port of Igoumenitsa. Emphasis was also given on the general prospects of LNG development in the area of Western Greece. The event was welcomed by the President and Managing Director of the Port Authority of Igoumenitsa, Mr. Andreas Ntais. Partners of PMII programme presented the supply chain of the Programme (Maria Fotiadou, DEPA), the monitoring of air pollutants in the port of Igoumenitsa and the results from the measurements (Adamis Mitsotakis, CERTH) and the contribution of small-scale LNG facilities in Revythousa to the supply of Western Greece Tatiana Eleftheriadou, DESFA). The location of small-scale LNG facilities within the port (Christos Solomonidis, Rogan) and the regulatory framework for the supply of LNG as marine fuel to ships (Anastasia Kouvertari, Lloyd's Register) were some of the additional themes covered by the partners. The event was concluded with a discussion between participants on LNG refueling operations, available technology, safety guides, and general guidelines for drafting the Port manuals for future LNG bunkering operations. What is Poseidon Med II project? Poseidon Med II project is a practical roadmap which aims to bring about the wide adoption of LNG as a safe, environmentally efficient and viable alternative fuel for shipping and help the East Mediterranean marine transportation propel towards a low-carbon future. The project, which is co-funded by the European Union, involves three countries Greece, Italy and Cyprus, six European ports (Piraeus, Patras, Lemesos, Venice, Heraklion, Igoumenitsa) as well as the Revithoussa LNG terminal. The project brings together top experts from the marine, energy and financial sectors to design an integrated LNG value chain and establish a well-functioning and sustainable LNG market.